This morning a friend shared with me some amusing American Sign Language videos, and in return I wanted to share with him my favorite ASL video of all time: B. Storm's interpretation of the Gnarls Barkley song Crazy. Only I couldn't because it was gone. Why? 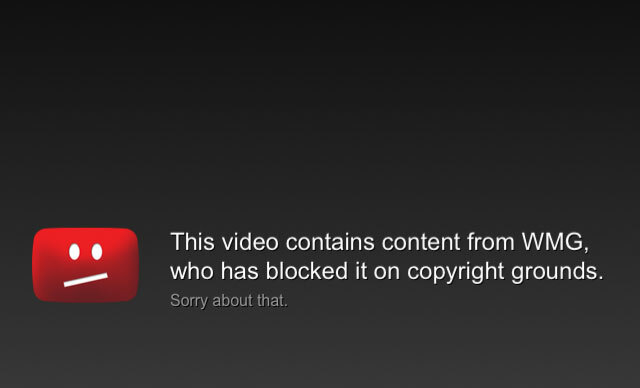 Because "This video contains content from WMG (Warner Music Group), who has blocked it on copyright grounds." This is appalling for many reasons, not least of which being the video is almost certainly fair use. Copying is not theft, but censorship is. When a video is blocked, banned, erased, or otherwise censored, we don't have it any more. The commons is robbed. When B. Storm copied the song Crazy into his video, WMG's copies were still there. When WMG censored B. Storm's video, it was gone. Great art like this matters too much to passively let monopolists erase it from our common culture. When you find good videos online, consider making local back-up copies. We never know what's going to be censored when, and without audience back-ups some great art could be lost forever.